It seems that lots of people are making “kydex” holsters these days. Late 2012 I was given one to review from a training academy I attend. Here is my take on this particular holster. This is an IEB Appendix carry holster. 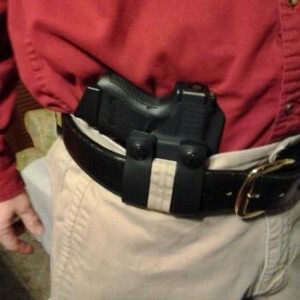 The holster fits “across” the belt loops to assist in holding it in place, or you could just place it between loops, however that dramatically effects the draw and I do not recommend it. In Part 1 I gave you one step to improve your life, reading. In Part 2 we discussed Taking a Class, Researching things and Practicing what you have learned. Today, let’s continue our growth. 5. Apply yourself. If you want the money to buy a new gizmo, or if you are tired of being broke, apply the previous recommendations. Make your own coffee and skip the Starbucks, bring a MRE and skip eating lunch out. Quit smoking. Heck, get out the telescope and look at the stars. Admire them. That is part of applying yourself. We all need to improve and grow. Whether it be for our careers, personal hobbies, family life or spiritual wellbeing.